The Master encourages all sincere seekers to read the following books for a basic familiarization with the essence of the Light and Sound Teachings prior to requesting to become a chela (student). They are available on the Introductory Materials page. 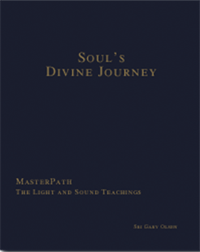 The MasterPath embodies the divine goals of Self and God Realization, and thus requires a keen desire and deepest yearning to pursue these lofty levels of true spirituality. If you are presently involved with and deriving benefit from a path, it should be honored and maintained, as attempting to follow two separate paths simultaneously is not advised. If you wish to request chelaship from the Master, please send a letter to Sri Gary Olsen expressing your spiritual desire to embrace these Teachings, and provide your contact information below. If your request for chelaship is accepted, chelas of the Master pay monthly dues of $30. New chelas will receive an introductory packet including beginning guidelines from the Master and a set of recordings outlining the recommended daily spiritual practice. Every month thereafter, chelas receive a monthly mailing, which consists of a written discourse and a recording of one of the Master’s satsangs (talks). Chelas of the Master also have access to the entire library of Sri Gary’s written and recorded materials, the opportunity to attend the Master’s seminars held throughout the year, and, most importantly, the ever-present love, guidance, and protection of the indwelling Sat Guru. Your contact information will be held in the strictest confidence. Your date of birth must be 18 years or older. If you wish to submit dues, you may do so on the next page after submitting your letter. If the form on this page displays correctly and you still experience difficulty sending your letter using the window above, please make certain that your Internet browser has all the latest updates or try switching to another Internet browser. If this does not resolve it, please contact the webmaster to report the difficulty.